PEST chart is a useful tool for understanding market growth or decline, and as such the position, potential and direction for a business. Business leaders use PEST chart to understand the vision of the future for the organization and share this vision to the company employees. 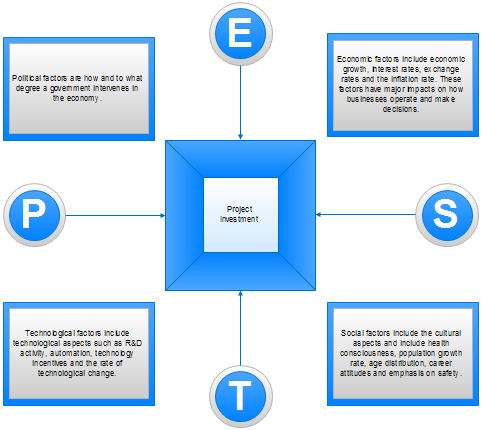 PEST Chart, short for Political, Economic, Social and Technological factors analysis chart, which is used to assess the market for a business or organizational unit. It helps you understand the "big picture" forces of change that you're exposed to, and, from this, take advantage of the opportunities that they present. Why PEST chart is important? 1. It helps you to spot business or personal opportunities, and it gives you advanced warning of significant threats. 2. It reveals the direction of change within your business environment. This helps you shape what you're doing, so that you work with change, rather than against it. 3. It helps you avoid starting projects that are likely to fail, for reasons beyond your control. 4. It can help you break free of unconscious assumptions when you enter a new country, region, or market; because it helps you develop an objective view of this new environment. How to Create a PEST chart? In Edraw, the PEST Template helps you easily create PEST charts using many built-in symbols. Double click the template from Business Diagram Category on the starting page to enter the drawing page. You will discover abundant symbols and easy-to-use tools available for PEST charts. Edraw includes lots of PEST symbols created to meet users' different drawing requirements. 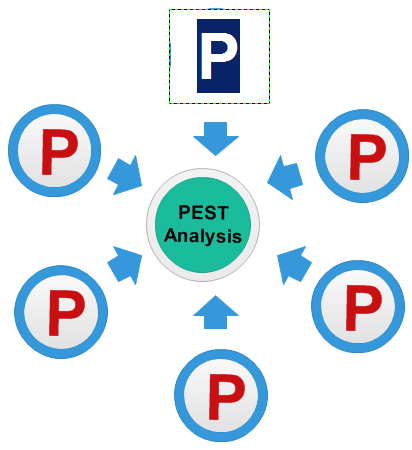 In Edraw library, PEST symbols like basic PEST, PEST matrix, PEST bar, PEST box-level, circular PEST, text box and more are available. Go to PEST Chart Symbols page to have a general knowledge about the symbols. 1. On the File menu, point to New, point to Business Diagram, and double click PEST Chart. A new drawing page will open. 2. Go to the library pane on the left of the canvas. From PEST Shapes, drag PEST shape onto the canvas. 3. Use Arrow Shapes when you need to connect these shapes. Note: Double click the Circle shape to edit the text in the circle. 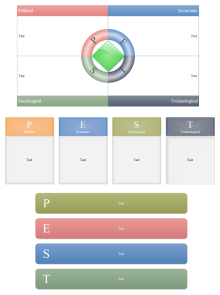 Print: When a PEST diagram is done, it's easy to print and share with more people. On the file menu, point to Print to set for print options. You can change settings with fewer clicks and see the print preview in real time. Export: Edraw offers support for exporting your diagram to various formats, including Microsoft Office, PDF, and many other graphic formats. On the File menu, point to Export & Send for Export options. Edraw has built in a set of nice looking themes with advanced effects. It's easy to change the whole diagram by changing the active theme with just a few clicks. You don't have to be professional in designing. All Edraw documents are vector graphic files with high clarity and available for reviewing and modifying. A set of smart tools are provided for automatic formatting. You can easily arrange, rotate, group and align objects. Edraw offers various customization options, using which you can adjust line width, line color, line style, font size, font style, text color, and much more. Easy to add photos, images and edit text fields. 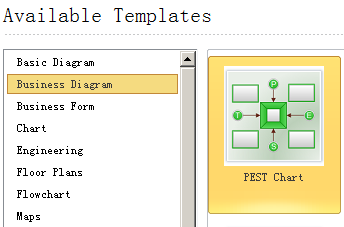 Here is a complete examples of PEST chart created by Edraw.